The Book Pharmacy - Home. What is The Book Pharmacy? The Book Pharmacy prescribes and dispenses bespoke book bundles, connecting readers with the right books. 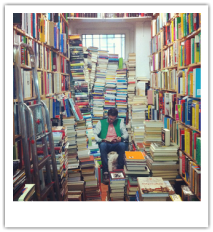 The Book Pharmacy is a young Berlin start-up that is revolutionising the process of buying books. The Book Pharmacy is a social initiative to promote literacy and popularise literature. 1. Access to a personal shopper service for books that not only provides you with the books most suited to your needs and wishes but saves you the time and energy otherwise spent book buying. 2. The ability to browse and select one of our intelligently compiled, preselected book bundles which equip you with a series of books relating to a certain subject or according to a particular reading motivation. 3. The opportunity to use our unique book therapy service which, on the basis of a personal consultation, will prescribe a book packet tailored exactly to your present situation and requirements. 4. The capacity to simply and securely order amazing gifts online, in the form of personalised book bundles or gift vouchers, that arrive attractively packaged, delivered directly to the recipient's door. 5. The ability to sponsor a course of book therapy or donate a book bundle to those in need. So doing you can personally contribute to one of our programmes promoting reading and wellbeing in society, such as supporting the participants of Lesen und Schreiben, a Berlin charity for those with reading difficulties. Simply browse our website until you find the perfect package for you. Order easily and securely over our website and pay using PayPal or credit card. If you have selected a book therapy session, you can select an appointment for a personal consultation by telephone, Skype or in person. In each individual case, utilising their extensive knowledge and resources, our experts accordingly select a set of books to perfectly meet your specifications. We lovingly assemble and beautifully package your book bundle and have it delivered directly to your door. With all the comfort and convenience of online shopping, you receive a package of carefully chosen books, selected especially for you by our experts and not by machines. Who is The Book Pharmacy? The Book Pharmacy is the brainchild of Paul Armstrong Leworthy. Paul likes books. He likes reading books, reading about books, reading about buying books, buying books. Over the last ten years he has been involved in the study of books, the selling of books, the writing of books and the publishing of books.